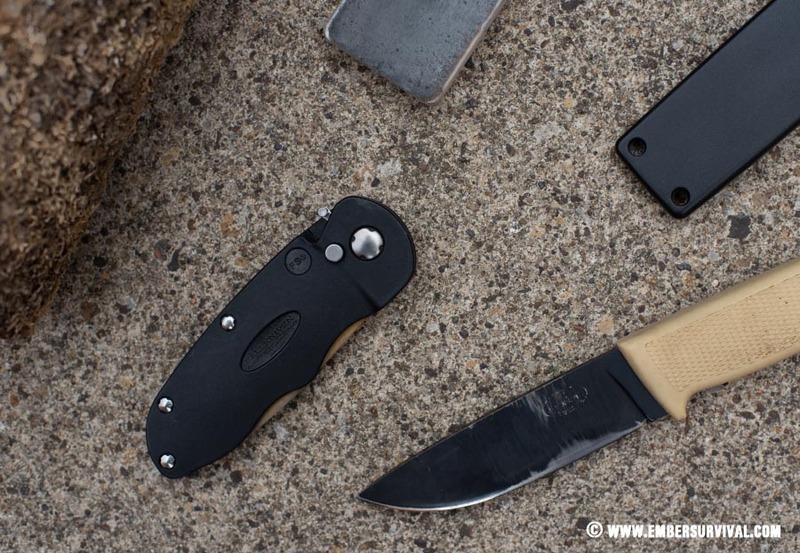 At first glance the Fällkniven FS4 appears to be a folding knife, complete with a handle and a ‘blade’. Instead of a cutting tool the ‘blade’ is actually the sharpening stone. This is protected inside a Zytel handle and with the press of a button the stone automatically flips out. The stone can then be locked in the open position, much like a traditional folding knife blade. The handle has grooves to aid grip and a dry slightly textured finish. 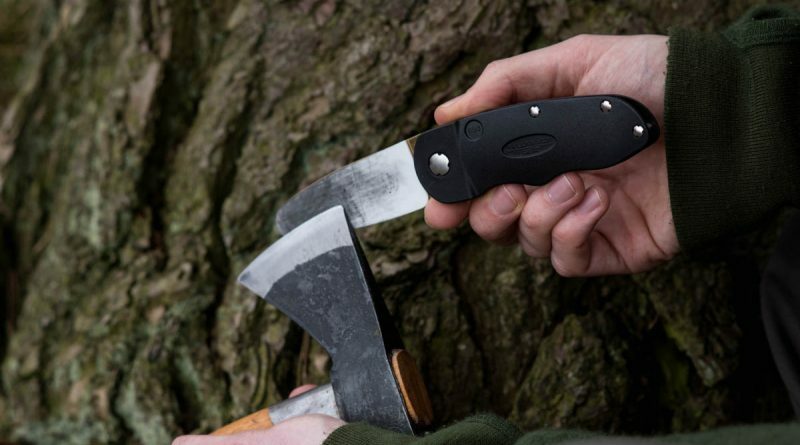 The Fällkniven FS4 is very easy to transport and put to use due to its compact size and folding stone design. As the FS4 has a handle it allows you to keep your fingers clear and use the entire area of the stone. This makes sharpening easier when compared to holding a stone directly. The lock prevents accidental deployment or closure of the stone too. The whole FS4 is very compact and has a durable feel to it. Supplied is a repair kit with utility tool and spare parts, this is a very nice touch. 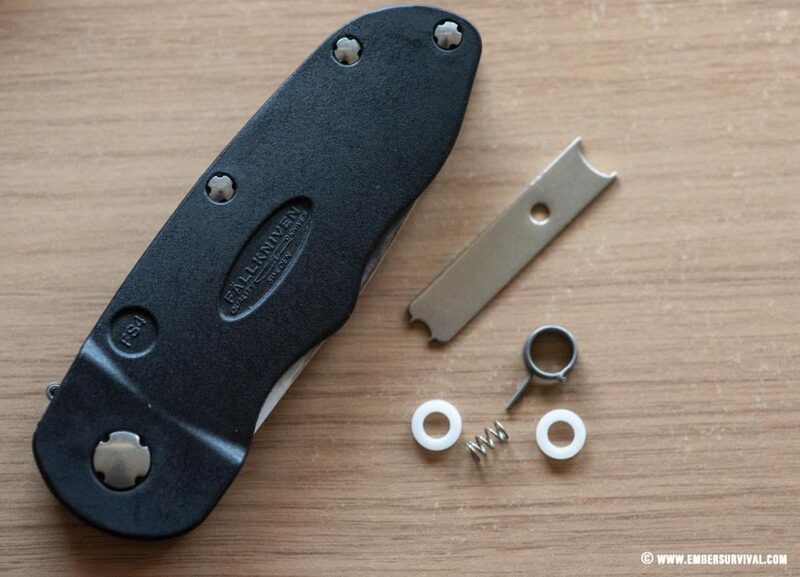 Fällkniven FS4 Sharpener with a collection of its supplied repair kit and utility tool. The stone is a combination of two sides, one diamond and one ceramic. These are strongly glued together with 3M tape. One is coated with Titanium Alumina Nitride and has a hardness of 10 on the Mohs scale. The other half is made of synthetic Sapphires and has a hardness of 8 Mohs. More important is the grit size, the diamond section comes in at 25 microns and the ceramic at an astonishing 1 micron. The result of this incredibly fine grit is that you can get your knives very sharp with consistent results. Your technique still needs to be on point however. 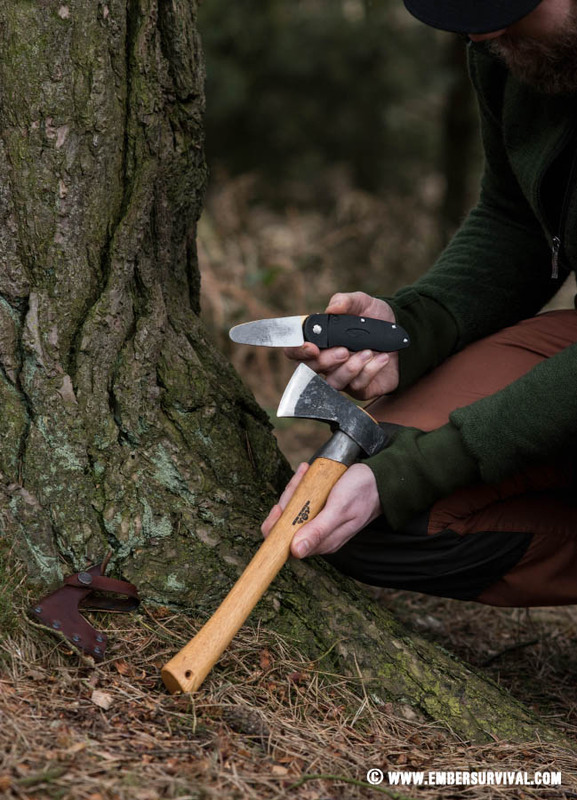 I like the Fällkniven FS4 as sharpening is very easy, especially on an axe. Much like you may use a ‘puck’ stone the FS4’s handle makes it very easy achieve regular circular motions. These are useful for sharpening convex bevels that are found on axes and some knives too. For more straightforward sharpening, for example on full flat ground knives the FS4 can be laid down on a surface. The user can then make regular sweeps across the stone. The combination of grits on the FS4 allow for quick removal of metal and fine honing, all in one package. The FS4 stone can be used dry with no problem and at first it will seem a little rough but this will smooth out after a short time. You can also clean the stone with soap and water to keep it clean. The FS4 stone yields somewhat under downward pressure so it becomes very forgiving to the user who is trying to be as consistent as possible with their sharpening strokes. The yielding allows any mistakes you make to be slightly absorbed by the stone. One can also use a marker pen to colour in the bevel on the knife being sharpened to show very clearly where metal is being removed. Consistency is the key to sharpening and the FS4 helps the user achieve this. Fällkniven FS4 Sharpener alongside a leather strop and a Fällkniven F1dz. The leather strop really helps to perfect an edge and make it last longer. The F1dz is a fantastic knife. The repair kit that is included with the FS4 has already come in handy. I managed to successfully replace one of the special screws used to hold the handle together using the supplied tool and supplies. The diamond half of the stone removes metal at a good speed and the finer side adds a very honed edge. When sharpening knives you adjust your technique and make sweeping strokes instead of circular ones as you would on axes. 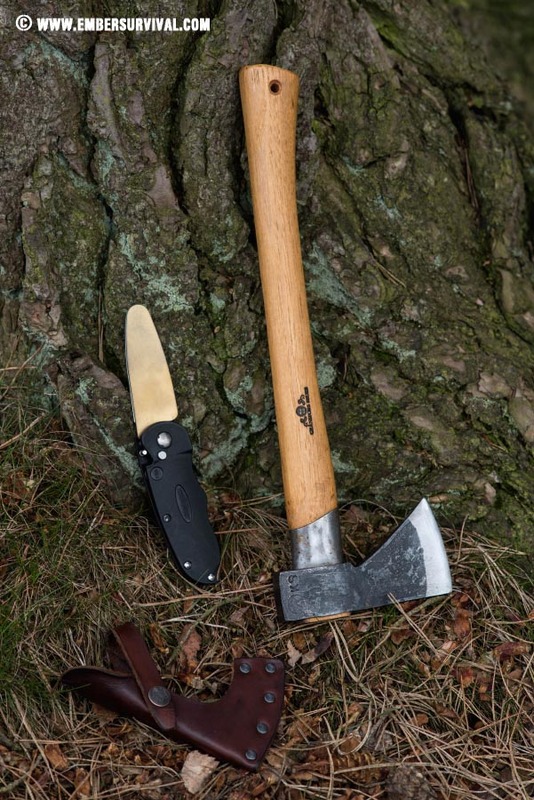 Fällkniven FS4 Sharpener alongside an axe. The FS4 is so small and lightweight that it takes up virtually no room. I would add a small collection of wet and dry paper and a leather strop with some compound soaked into it alongside the FS4 to create a complete sharpening system. This would be both lightweight and of a small footprint. You could easily take these with you on longer hikes where space and weight are at a premium. It should be noted that to sharpen knives with a convex bevel you should use straight sweeps against the stone.